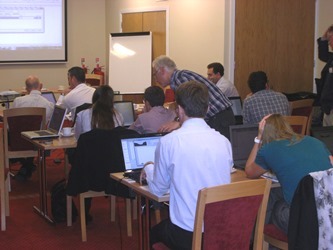 Training is an important part of the support we provide for Aquator users. We can provide dedicated training at a customer's site for a number of users, or users may attend the training courses at our offices which are put on from time to time. A popular format for training is to combine this with attendance at the Aquator User Group meetings where a training course is often delivered on the day preceding the meeting. If you have training needs for using Aquator, please contact us with a Training enquiry. Technical support is provided by the Aquator team for all registered users with a support contract. The purchase price for new Aquator licences, whether Outright Purchase or Annual Subscription, includes a one-year support contract. Help from us in running Aquator by e-mail or telephone in an emergency. Software upgrades for Aquator in response to new developments or fixes. Access to known software issues by the User log in page. Access to requests from users by the User login page. Access to workarounds and VBA macros by the User log in page. Ability to move the Aquator licence to a different PC. Support does not cover construction, development or use of specific Aquator models. For this we recommend you consider our consultancy services.